On Sunday 19 June I woke up to a cool and crisp summer morning – the perfect conditions for a highly anticipated 10 kilometre run! 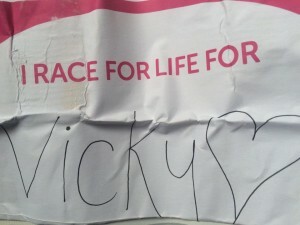 I had decided to take part in the Cancer ResearchRace for Life in honour of our beloved Vicky a couple of months previous. I was in a bit of a rut, having been out of work, feeling unfit and unhappy with my general lack of motivation to make a change. I decided I needed a goal, something to work towards that would give me a kick start. I saw an advert for the race, signed up and started a training programme designed for people who usually avoid running at all costs! As the weeks flew by I noticed my fitness gradually improving, the pounds starting to fall off, and what was more, I was actually starting to enjoy the routine of putting on my running shoes and trying to beat the previous day’s record. 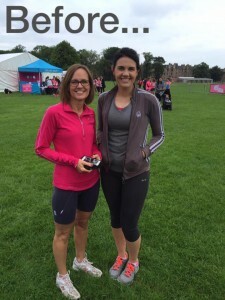 I had signed up to run the race in Edinburgh alongside my mother-in-law (an avid runner I might add!) and as we headed to the start line my stomach was full of bouncing butterflies. Looking around at all the other women I would be racing with and seeing them sporting the names of those they were running for was a stark reminder of how many lives are altered on a daily basis by this disease. As we lined up for the start of the race there was a call for a minute’s silence in memory of all those we had loved and lost. Taking a moment to stop and remember why I was there, the beautiful woman who continues to have such a profound impact on my life, was deeply moving – a powerful pause filled with the pain of my earthly memories and the faith-fuelled hope for all that heaven holds. The horn blasted and we were off; a horde of women all giving it our best shot. Notwithstanding a couple of painful stitches and unhelpful hills in the middle stretch, I managed to chug along and even enjoyed some of the stunning views over the city. As I entered the final kilometre of the race I was determined to catch up with my mother-in-law, running a couple of hundred metres ahead of me. 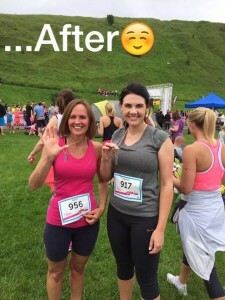 I picked up the pace, pushed as hard as I could, and managed to catch her just shy of the finish line which we crossed together, cheered on by our hubbies on the sideline. A deep sense of relief and a huge sense of accomplishment in not only completing the race, but achieving a personal best, finishing in 1:07:30! Vicky challenged us all to be intentional about what we will do with our one wild and precious life. Voluntarily running for 10 kilometres isn’t something I ever expected I would be inclined to do, but Vicky was all about pushing past our perceived limitations and I am so happy to have run this race for her. The challenge now is to continue to dream big dreams and pray bold prayers, living bravely in the knowledge that God has more for us than we could ever ask for or imagine.